When you think about New Mexico, you probably think of pueblos and UFOs (think Roswell). The state also has a large number of National Park sites, most notably Carlsbad Caverns, White Sands, and Chaco Culture. However, the state boasts a number of underrated National Parks. They represent some of the most unique history and science — unlike anything you’ll find in any other state. 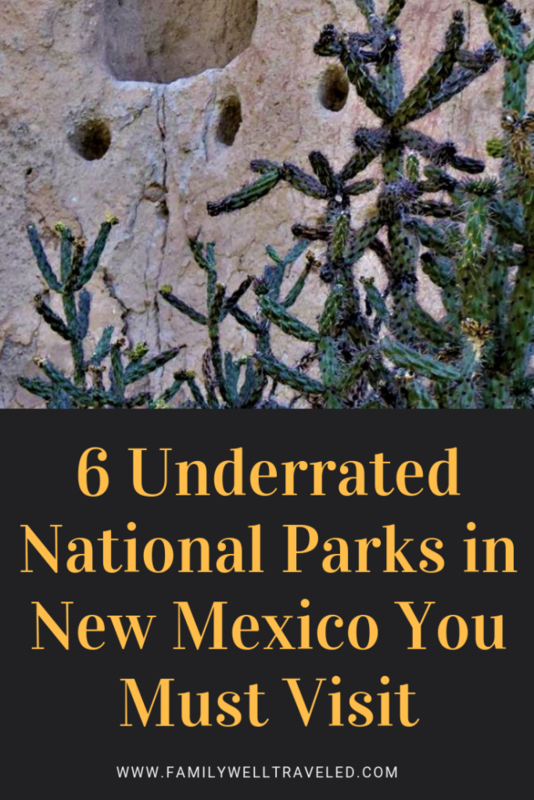 We have visited New Mexico a couple of times, and we visited six of these underrated parks. Here is a guide to six national park site in New Mexico that are definitely worth a visit. The remains of Spanish Mission Church at Pecos. 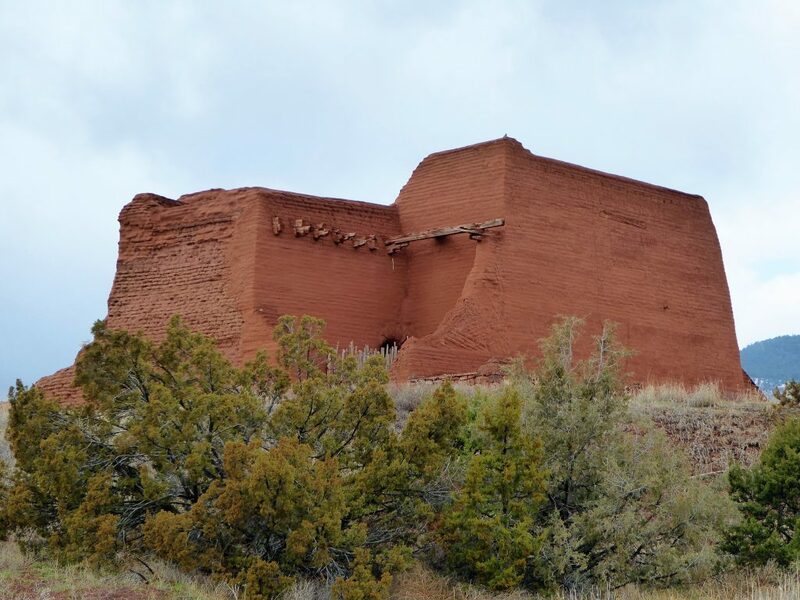 The first of our underrated National Parks in New Mexico is Pecos National Historic Site. Pecos has a little bit of everything. It was a central location for the Ancestral Pueblo people. In the 1500s, Spanish Conquistadors moving up from Mexico settled here. They were followed by Franciscan Friars who built churches and attempted to convert the Pueblo to the Catholic faith. The Pueblo revolted in the 17th Century, but the Spanish remained a presence in the area. 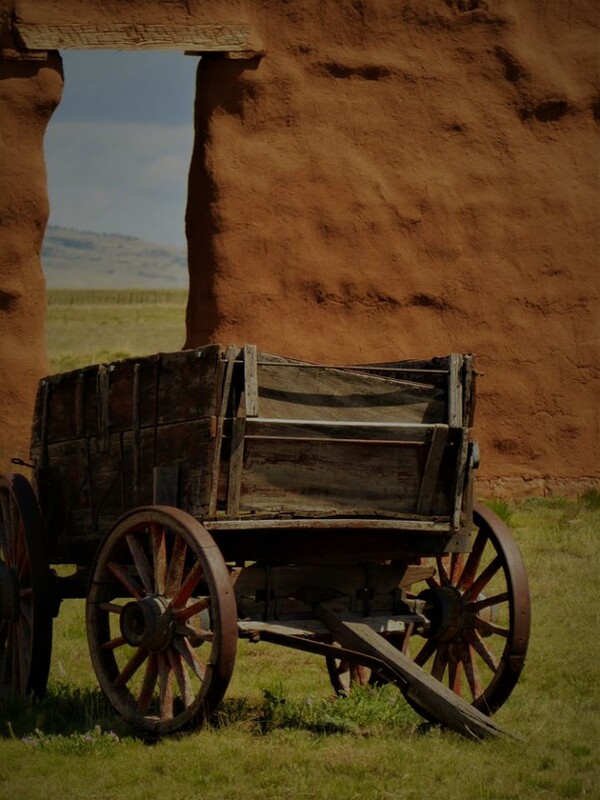 Pecos also was a stop on the Santa Fe Trail, as wagon trains wheeled through during the United States’ 19th Century expansion. And New Mexico’s location next to Texas created tensions during the U.S. Civil War. Pecos is the site of the most western battle in the Civil War — the Battle for Glorietta Pass. Today, you can walk a 2.25 mile trail around the battle site. And if that isn’t enough claims to fame, Pecos also contains a cattle ranch, once owned by actress Greer Garson and her husband. Garson, infamous for giving the longest speech in Academy Awards history after her victory as Best Actress, narrates a film at the Visitor’s Center, highlighting some of the history of the site. 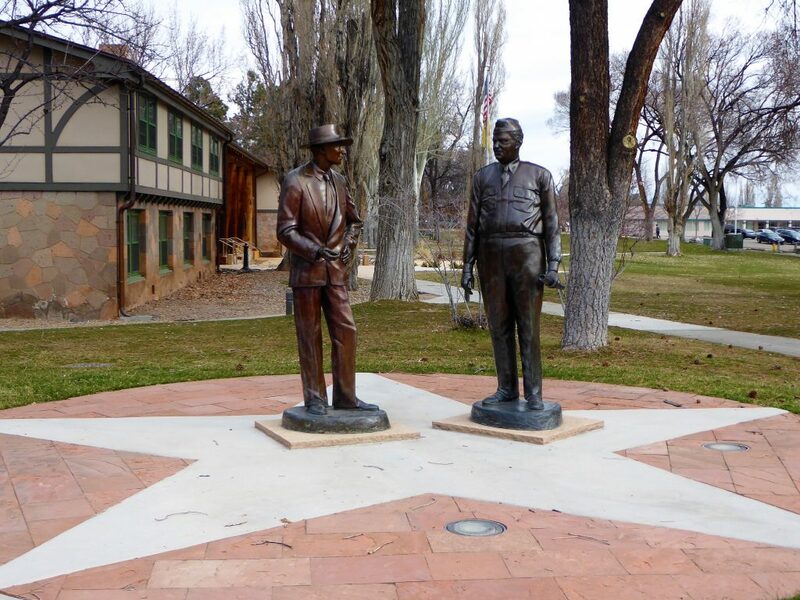 Statues of J. Robert Oppenheimer and General Leslie R. Groves in Los Alamos. Los Alamos, the secret site for the Manhattan Project, is infamous for its role in the Atomic Bombs that ended World War II. During the 1940s some of the most brilliant minds on the planet assembled in the mesa top town. These scientists, including J. Robert Oppenheimer, collaborated with the U.S. Army in the creation of the A-bomb. Today, The Manhattan Project is no longer a secret. However, the site is still an active Army location with top secret work. Although you need security clearance to enter the current Manhattan Project site, you may tour the homes and buildings so important to the historic Manhattan Project of the 1940s. The Manhattan Project National Historical Site showcases the important role of the site during WWII. Los Alamos is one of three locations for the Manhattan Project National Historic Site. The other locations are in Tennessee (the location for uranium processing) and Washington (the location for the plutonium processing and assembling the bombs). Our family enjoyed walking around downtown Los Alamos and seeing the locations central to the Manhattan Project. However, we did have some problems finding the Visitor’s Center. The Visitor’s Center is a small office annex, however, my phone GPS led me to a private residence. While the center has a small museum, we left feeling there could have been much more. The Rangers and volunteers at the Visitor’s Center did encourage us to visit the Bradbury Science Center, a free museum with a more detailed history of the science behind the Manhattan Project. The tour is self-guided. We did enjoy going to the Bethe House where someone was on site to explain the home and answer questions. Here, we also saw a Nobel Prize Trophy and other awards for the scientists who helped change the world. For those interested in recent history or WWII, this is one of the National Parks in New Mexico you cannot miss. One of the glyphs at the Monument. Black basalt volcanic rock with thousands of etchings by Native American peoples are found in the middle of the booming city of Albuquerque. 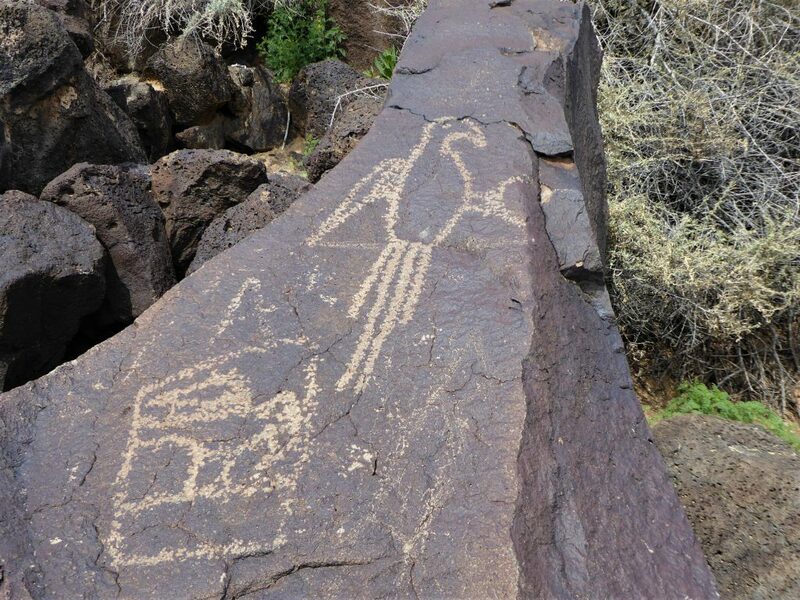 Petroglyph National Monument surprisingly is located in the middle of a large, modern city. While visiting, you park next to modern grocery stores, gas stations, and airfields. From the parking lots, you hike up the hills and sandy desert pathways to see petroglyphs hundreds of years old. It is a stark contrast. More than 130 million years ago, volcanoes in the area spewed the black basalt rock later used by the indigenous peoples. Some of the volcanoes still jut toward the sky at the monument. But the real attraction at the Monument are the petroglyphs. Visitors take three hiking trails throughout the site. On these three trails, you find hundreds of etchings — representing animals and people. You also find petroglyphs with geometric shapes or patterns. Some of the the etchings tell a story easily decipherable by modern people. Other glyphs are difficult to understand. Do they represent religious values of the ancients? Are they moral stories? Do they tell of something our modern minds have lost over time? Located in the Frijoles Valley, Bandelier National Monument displays the history of the Ancient Pueblo people in cliff dwelling homes carved out of volcanic tuff. On a self-guided walking tour of Bandelier, you climb ladders into the homes of the Ancients. You witness the kivas, round underground rooms that were the center of religious life for the Pueblo people. Read more about Bandelier and other things to do in and around Santa Fe. The valley and cliffs contain petroglyphs and structures 11,000 years old. Approximately 130 million years ago, New Mexico was a boiling pot of volcanoes, dotting the landscape. From this volcanic activity, many of the National Parks in New Mexico formed. 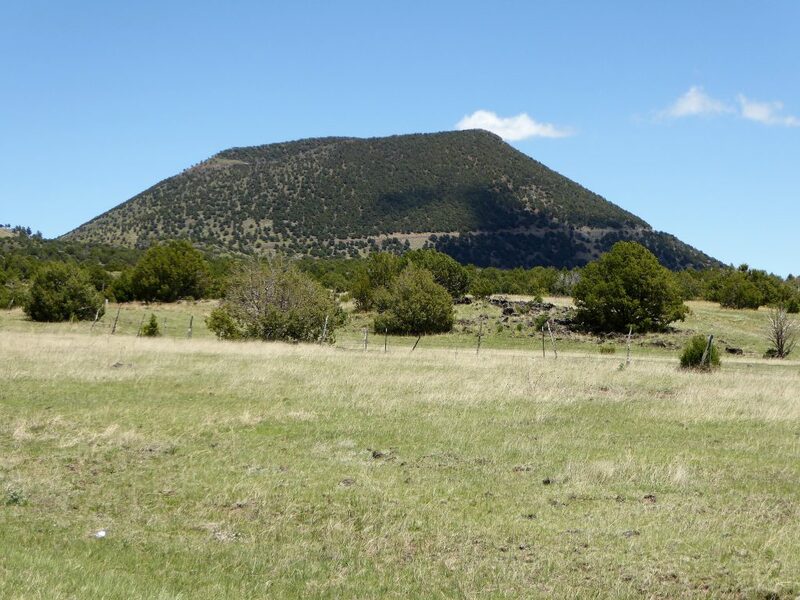 Capulin Volcano in Northern New Mexico, is one of the once-active volcanoes. Over the eons, the volcano became dormant. However, it still holds a place in history. The volcano was a recognizable landmark for travelers on the Santa Fe Trail. For the weary travelers journeying from Missouri, the mount was a sign that their journey to Santa Fe was drawing to an end. A road up to the mouth of the volcano is precariously narrow, but the view at the top of the mountain makes the drive worthwhile. The views go on for miles, and you can see a grand vista of plains and the Rocky Mountain Range from the 8200 foot vantage point. Once atop Capulin, visitors can hike a couple of trails, one around the mouth of the volcano, and one into the heart of the vent. While at the base or the peak, take a look for the area flora and keep your eyes open for wildlife abundant in the area. Read our Four Things to Do at Capulin Volcano National Monument guide. Fort Union National Monument is one of the least visited of the National Park sites. That’s a shame. Located just eight miles off of Interstate 25, the park preserves the history of the fort, which was the main U.S. Army station in the southwestern United States. The Monument is special. Unlike many other national park sites which vigilantly attempt to maintain the historical structures, Fort Union preserves the site differently. 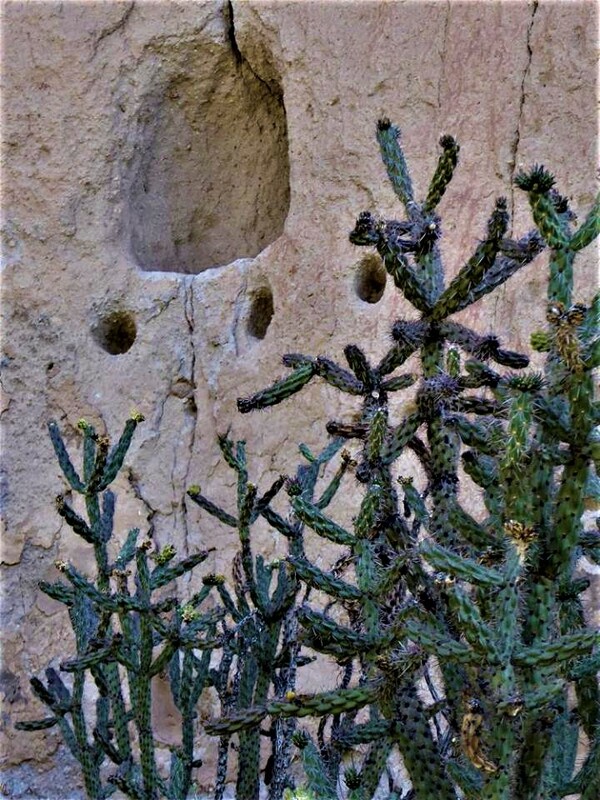 The park allows the passage of time to wear at the fort’s adobe walls. So, you can watch the decay from time and its effects on the walls, many of which have fallen. The fallen walls simply return to their native, natural elements. Some of the walls are monitored through cameras and scientific apparatus in order to determine their stability, weight, and probability of falling. Learn more about Fort Union and two other Western U.S. Forts. Fort Union was also one of the stops on the Santa Fe Trail. As a military fort, it represents some of the tensions of a growing United States. White settlers took over some of the ancestral Native American lands and trade routes of the Mexican and Spanish settlers. We were reminded that the U.S. flag, flying high above the prairie lands of the Rio Grande Valley was a welcome sight for some travelers. It was a source of contention for others in the region. 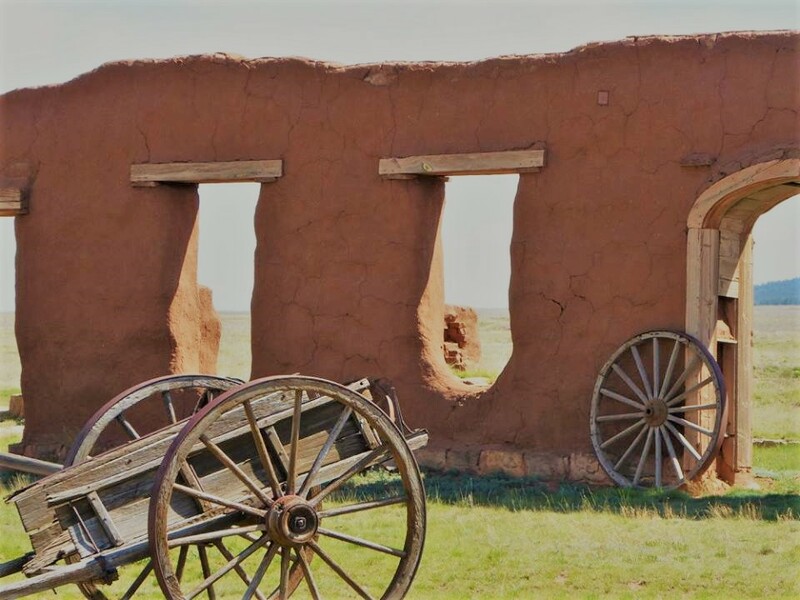 While Fort Union was only active for a couple of decades, it represents some of the same history as that of Pecos National Historic Site, an hour’s drive away. Both sites saw a conglomeration of cultures and nationalities struggle in the desert southwest. To Learn more about these and the other National Parks in New Mexico, go to the NPS Website. Each of these National Parks in New Mexico is suitable for family travel. However, to make the trips more enjoyable, each site provides Junior Ranger books, badges and patches for children. 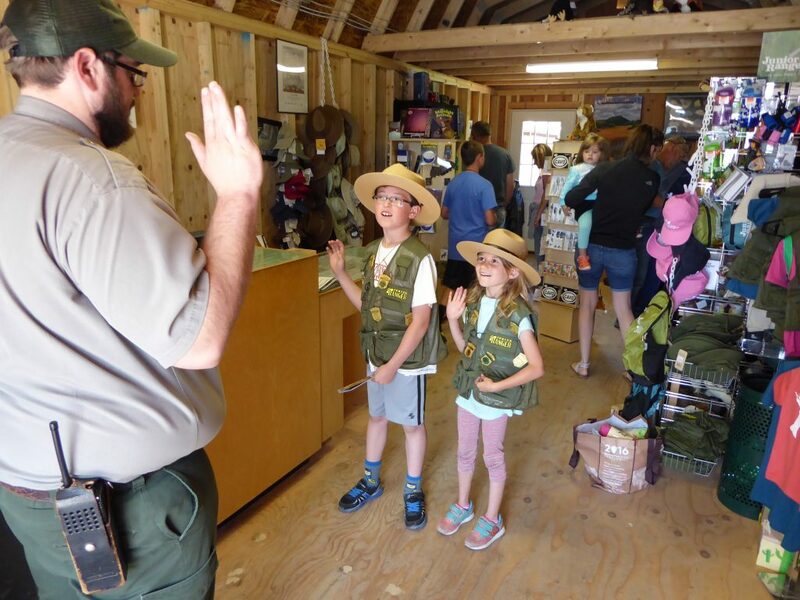 To participate in the Junior Ranger program, drop by the Visitors Center at the beginning of your trip. Ask a Park Ranger for a Junior Ranger book. Each book will have a number of activities for children to complete. Activities are age appropriate and give kids valuable insights into each park. Our kids love the Junior Ranger program. It helps make each site visited more entertaining and pertinent. The reward of a Junior Ranger badge or patch a book’s completion appeals to our kids. The badges give a visual reminder of their visit to each NPS site. And they bring back lots of fun memories for our family. If you’re traveling to NPS sites with kids, there’s simply no better way for the kids to engage than by participating in the programs. Read about the Amazing National Parks of South Dakota. Discover some of the National Parks of New York with our two day Manhattan Itinerary. Have you visited the National Parks of New Mexico? Did we leave out an underrated site in the state? Share your thought with us. We would love to hear from you in the comments below. Read more about these National Parks in New Mexico.